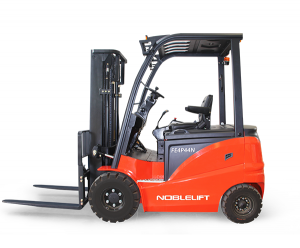 The creative, intuitive and elegant design of the N Series makes it a coveted ride for the operators, the rugged exterior molding of the metal covers delivers styling as well as safety. The excellent ergonomic design offers exceptional reliability, easy maintenance, efficient and comfortable operation; with a focus on safety and environmental responsibility. The rear hand holder with horn function, for safe, comfortable operation and positioning for the operators during backing. Hydraulic operating handle on the right side, enhanced with ergonomic engineering, and greatly improved driver comfort. Foot brake with suspension system, increased operating space at the foot and brake operation comfort for driver. Foot-type parking brake system, the driver can apply the brake without changing their posture, so long as foot gently steps on the parking brake, driver fatigue can be effectively reduced. 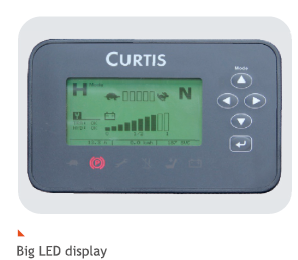 Large LED display with big LED screen; Error code and warning display for easy monitoring of the forklift status. Motor controllers, contactors, power switch, emergency switch, display, accelerators and other key electrical components made by proven manufacturers. Advanced AC high frequency integrated MOSFET controller and CAN-bus technology. High frequency MOSFET integrated controller ensures smooth, accurate driving and lifting, excellent acceleration, motor and controller performance matching delivers safety and reliability; such as regenerative braking and reverse connection ramp anti-slipping. Emergency power off switch as standard configuration, meets the European safety norms. Descending speed will automatically slow down before the fork lowered to the minimum height, so it substantially reduces the impact noise. Rear axle using the flexible shock absorption system, effective filtrating the ground clutters, makes the driver much comfortable. The exceptional, dynamic, elegant design makes the N Series a desirable ride for the operators, the robust metal molding of the exterior covers delivers styling as well as safety. The ergonomically designed, inclining adjustable small-diameter steering wheel and combined switches, makes the forklift easy to operate. The back-and-forth adjustable seat allows the operator to select the optimum driving position. Large grab handle meets the needs of operators who vary in height, making it more comfortable. The super low torque steering gear means the steering is more light and responsive. Standard equipped with LED lights, saving on average 80% more energy. Different speed modes to choose from for different applications and different environments. Standard DC converter is balanced using batteries, extending battery life. High efficiency AC power system, offering complete protection, comes with speed sensor, temperature sensor which greatly improves reliability and life expectancy. Special tire patterns for electric forklifts, saving more than 10% more energy for driving (optional). With its optimized mast concept and arrangement of the hydraulic pipes, as well as the other parts, together with the large opening of the fork carriage, the operator view is much better and more comfortable for safe operation. Large arch overhead cabin guard, and grid plates with a comfortable angle, the driver’s view through the above cabin is greatly increased. Small-diameter steering wheel and other instruments located further right, reducing the height of the instrument bench, effectively increasing the visibility of the fork tip and goods.